The Botvac D7 Connected, which boasts connectivity with the iPhone and Apple Watch, can now be updated to gain new enhancements for users with larger homes. In particular, the D7 can now calculate exactly how much power it needs to finish vacuuming, and recharge accordingly. This is helpful for times when the Neato Botvac needs to recharge mid-cycle. 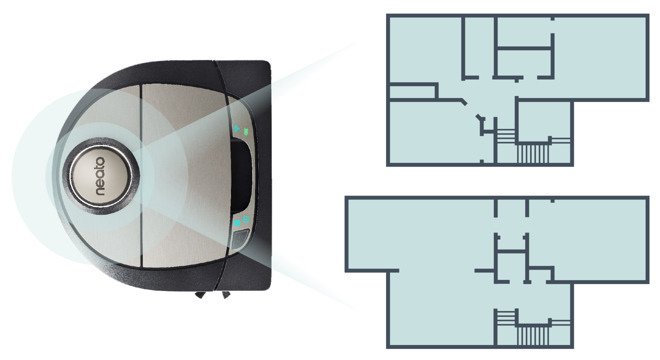 And with multiple floor plan mapping, the Botvac D7 Connected can map and clean multiple floor plans for multi-floor homes. This also includes support for virtual "No-Go" lines with multiple floor plans. AppleInsider reviewed the Neato Botvac Connected back in 2016, and found it to be one of the best robot vacuum cleaners available on the market. In addition to offering controls via iPhone and Apple Watch, it also supports complex scheduling functions, cleans very well, and is easy to empty and clean. "This software upgrade marks a significant step forward at Neato in our commitment to personalized cleaning," Neato Chief Executive Matt Petersen said in a press release. "With Multiple Floor Mapping and Neato Quick Boost, we saw an opportunity to respond to a consumer need quickly, whilst making the robot smarter with these significant software updates. At Neato, we know that some of our consumers have large homes to clean, and more than one floor. They need to be able to have the freedom to create a more personal cleaning experience, and to have a product which has the charge and ability to clean the whole home automatically." The Neato D7 Connected retails for $799, but is currently available for $698 with free shipping from Amazon.